Brighton is a sea side City, around an hour from London. It is the sort of place you go for a day trip. Although there is a beach there is no sand and while Brighton can be fun it is also rather run down and undercapitalised. I know the place, especially its housing, well having been the Director of Housing from 1996 to 1999. The shop I wanted to visit and review is located in the North Laines area of the town, just a short walk from the station. When I lived and worked here this was not an area I often frequented – its a bit hippyish, touristy, often crowded. The sort of place you go to buy a present or just mooch around. Ditto Fabrics is located here, and if you are in the area I think it is worth a visit. The shop was founded by Gill Thornley in 1983 (so all that time I was there, she was there, and we never met). They have had a website since 2010. I met Gill working in the shop when I dropped in last Saturday on the way for a lunch date with my husband’s family – Chris, Carrie, Ben, Mel, Maia, Charlotte and Lee at the Regency. She is very animated and it was hard to get a photograph of her that isn’t blurred. In this picture she appears to be levitating the fabric – actually she is just ensuring it is cut on the grain. “We always cut on the grain” explained Gill. What a good idea – reduces waste and saves the purchaser the trouble of pulling threads or tearing cloth when you get home. I hit it off with Jill immediately. She comes from Chorley in Lancashire, has a degree in fashion and lots of experience making clothes. She travels to Italy to buy unusual cloth (have a look at her vintage Italian silk), and I would say her prices are reasonable. Not as great as Simply Fabrics but mid range and acceptable. I asked for advice on putting in a jeans zip, and sewing PU fabric. I have never used polyurethane coated fabric before, but I saw this picture and thought that my silver accented SWAP might benefit. Anyway the advice is to sew in a cold room – if it’s too warm the fabric sticks to itself. You have to wonder what it is like to wear. I also liked the way Gill arranged the fabrics – putting complementary colourways together regardless of the fabric. I would do this too if I had a shop rather than sticking all the linens together, for example. Here are her vintage silks. I got a remnant of the dark green and purple squarish pattern (bottom centre). Anyway this is a nice shop run by a great woman who you will enjoy talking to. 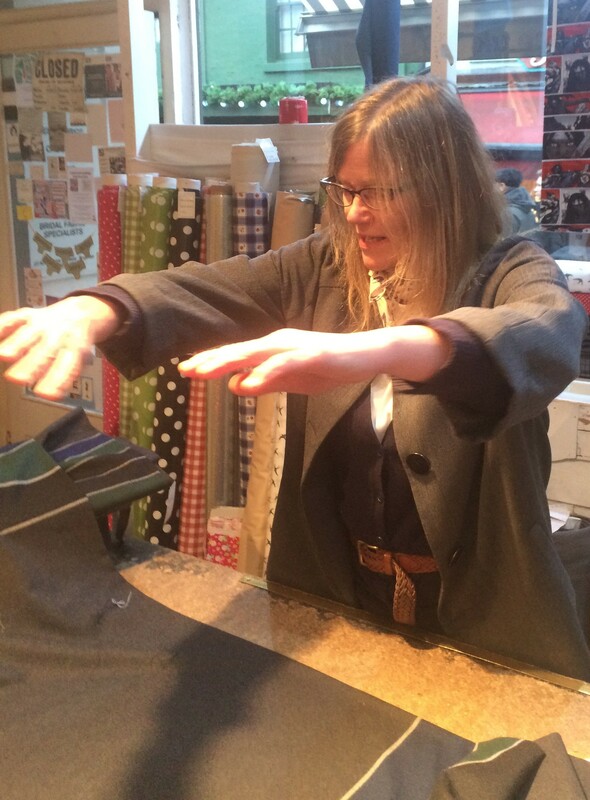 As I entered the shop on Saturday I immediately recognised one of the customers – Jane from Jane Makes. Then I realised she was shopping with five other bloggers and Instagrammers, three I followed already and a further two I now know. Its funny when you follow people you sort of feel you know them. Certainly Clarinda Kaleidoscope seemed like an old friend. Crashing Sussex SewBees meet up! I’ve been to Ditto several times when I’ve been in Brighton for work; the staff are all lovely and helpful. I too love the way they arrange their fabrics by colour rather than fabric type. Worth adding that their mail order service is excellent – next day delivery and the fabrics are very carefully folded and wrapped. So glad you enjoyed your visit to Ditto Fabrics! I’ve been going there for years and Gill is certainly a mine of information, she spent so much time with us on Saturday when we all landed on her at once as part of the meet up. It was just amazing that you arrived when you did – another few minutes and we would have moved on to the next venue! Great to see you. I went to Brighton a couple of times last year with family members who live in London and felt the need to get some clear air. I didn’t get to Ditto, but next time ……………. Lovely to meet you, however briefly! I was certainly very happy with my purchases that day. What did you buy Seamsoddlouise? I bought denim, silver PU, some wool (being cut above), a silk remnant, a lace remnant and a couple of zips! Ooops. 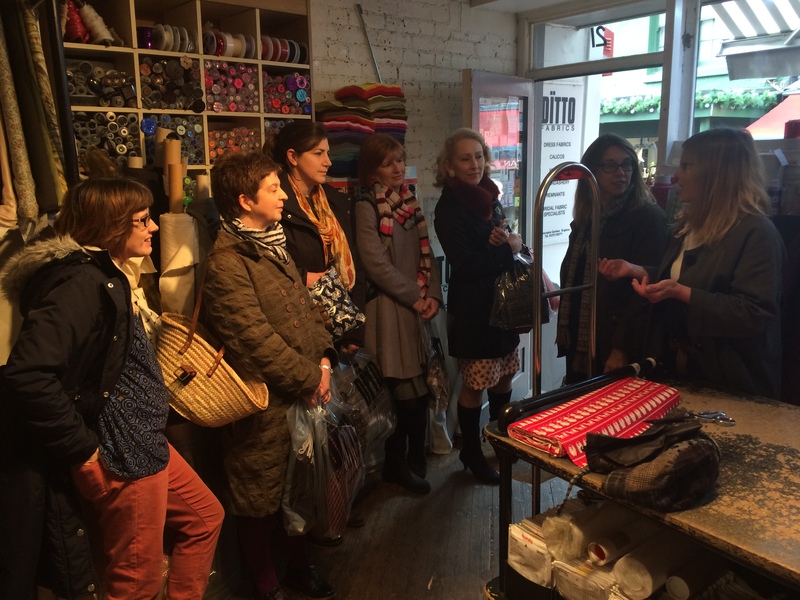 Great to see photos of the shop and info about the owner Jill. I’ve used their mail order service a number of times and Ditto are on my go to list when looking for fabric. What an interesting post. Animated certainly is the word! Just before you arrived we had been given a demonstration of the burn test and had the differences between English ponte roma and genuine Italian Ponte roma explained to us. Hope to bump into you again! Having stalked you on IG I felt I knew you – an odd feeling! And I would like to know the difference between the ponte romas! 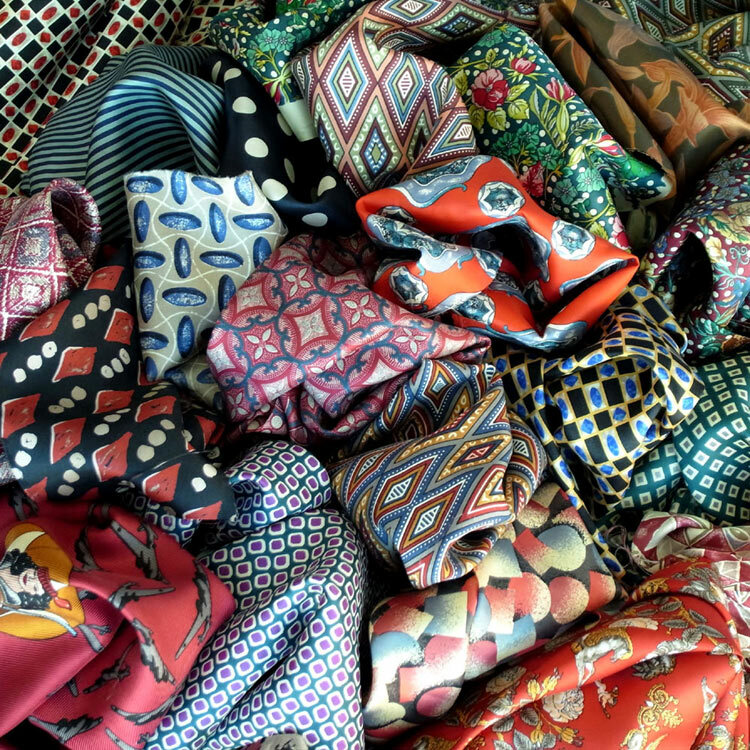 Gill obviously goes to Italy quite frequently to buy cloth – how wonderful is that! I have a niece in Brighton, so I wondered about this shop. She doesn’t sew, so I am glad you shared your experiences. When I lived in Surrey a trip to Brighton was often on the cards and incomplete without a visit to Ditto. It’s a lovely shop and I really rather wish that Gill would come back to her hometown (which, incidentally, is where I live) and bring her fabulous fabrics with her. Till then….it’s the website for me! Hurrah for Chorley Pendlestitches. Have you been to Bury market? I have a review of that coming up. Oh! Lightbulb moment, it was Bury market that I meant in a comment here once, I said Blackburn, doh! I loved it, the produce was stunning, I bought fabric that I haven’t used yet too. I’ll watch out for your review. Also, when you figure the draping out I may have to copy, I love the Westwood vibe. Well Blackburn market did used to be great and I loved going there. But it has effectively closed down. But Bury is nearly as good. I loved it. And thanks for the Westwood feedback Annie. It’s too long since I managed a visit to Ditto. My stash is so huge I shouldn’t even think about it but it is a lovely shop.